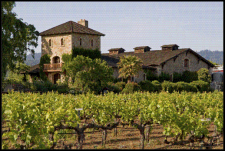 Lots of wine aficionados fall in love with the notion of owning a vineyard or winery. But adding a vineyard to your list of assets is about a lot more than pursuing a passion for the grape. Like any other business, this one takes hard work and lots of cash as well as patience, determination, and—did we mention—lots of cash. Becoming a winemaker tends to be pricey. According to Terry Pershall, a real estate agent and former wine industry professional in Santa Cruz, California, who has matched vineyard buyers and sellers, the going rate for California vineyards ranges from $1.2 million to $50 million. A recent Paso Robles, California newspaper ad offered 50 acres of working vineyard and winery plus a four-bedroom estate home, separate office, assorted storage buildings, and wine inventory for $1.8 million. In another ad, a 4.5 acre “custom” winery and vineyard in the Santa Cruz mountain foothills included a home, winery facilities, equipment, tasting room, cave site, expansion permits, and vineyard for $3.85 million. Trade publication Wine Business Monthly (winebusiness.com) lists wineries for sale across the world. But before you start checking out prospective properties, make sure you know what you’re getting into, and that starts with defining your terms. “Though people often think that running a winery and a vineyard are one and the same thing, they’re actually two separate disciplines,” says Pershall. A winery often has a lab as well as myriad equipment you need to know how to operate and maintain. In contrast, a vineyard is an agricultural investment, a one-crop farm highly exposed to various forms of agricultural risk including crop failure due to fungus, pests, or even climate change. And of course, running a winemaking business also requires the sales, marketing, maintenance, inventory control, personnel management, bookkeeping, and basic business skills that every other kind of enterprise demands. Also like any other business, winemaking calls for planning that includes getting good legal, financial, and accounting advice. You’ll need a business plan, a budget, and an exit strategy. And you’ll need to consider the likely tax liabilities of your vineyard and winery. The Internal Revenue Service will want you to declare whether the venture is a business or hobby. The IRS defines a hobby as an activity one pursues without the intent of making a profit. If you’re in this category, you’re probably interested in winemaking for the pure joy and passion of it, whatever the cost, and you’re not focused on the bottom line. If profit is your goal, however, then the IRS may consider your winemaking venture a regular business. That’s good news in that it means you should be able to deduct expenses and losses. But simply saying you mean business may not be enough. You might need to pass an IRS “profit test” that asks you to show that your business earned income during three of the past five years. If the business is brand new, you could instead be asked to undergo a “facts-and-circumstances” test that considers a list of factors. Is there an element of personal pleasure in the endeavor? How much time and effort are you devoting to it? Are you managing it in a businesslike manner? In the end, questions of whether and how to follow your winemaking dream are likely to be highly personal. You may feel that after working long and hard to build your wealth you deserve a chance to do something you’ve always wanted. You may decide to become a winemaking expert and throw yourself into the details of viticulture and enology—or you may prefer to leave all that to experts you hire while you run the business side. Speaking with people who are currently and/or formerly in the business to discuss their experiences will help you to decide what path you want to take. But however you pursue this idea, it’s crucial to plan carefully and make sure that owning a vineyard and winery won’t torpedo your larger financial plans. We can help you consider your options. This article was written by a professional financial journalist for Phase 3 Advisory Services, Ltd and is not intended as legal or investment advice.